You are currently browsing the tag archive for the ‘filoli’ tag. Celebrate the abundance of spring flowers on display in Filoli’s magnificent historic gardens in Woodside, California for the 20th Annual Botanical Art Exhibition. The beautiful and extraordinarily accurate plant portraits by international and local artists will be on display in one of the West Coast’s most prominent botanical art exhibitions. The exhibition “A Palette of Flowers” will be on display February 23 – May 20, 2018. This theme celebrates the abundance of spring flowers on display in the magnificent historic gardens at Filoli, and will tie into other programs at Filoli during the dramatic Spring blooming season. Located in Woodside, CA, Filoli boasts a 654-acre property featuring a 54,000+ square foot Georgian revival style mansion turned living museum, 16 acres of exquisite English Renaissance gardens, a 6.8 acre Gentlemen’s Orchard, and a nature preserve with over 7 miles of hiking trails. Established as a private residence in 1917, Filoli was opened to the public in 1976 as a 501(c)(3) nonprofit organization and site of the National Trust for Historic Preservation. Filoli is dedicated to the preservation, interpretation, and stewardship of the cultural traditions and natural history of this country estate for public education and enjoyment. It is open Tuesday through Sunday, 10:00 am to 5:00 pm. It was a magical day in the gardens. With picture-perfect sunny skies and warm breezes, we could not resist enjoying the gorgeous grounds in full spring bloom. The Filoli volunteers made our visit very special by sharing all their knowledge about the history of the estate, even giving a quick personal tour of the home. 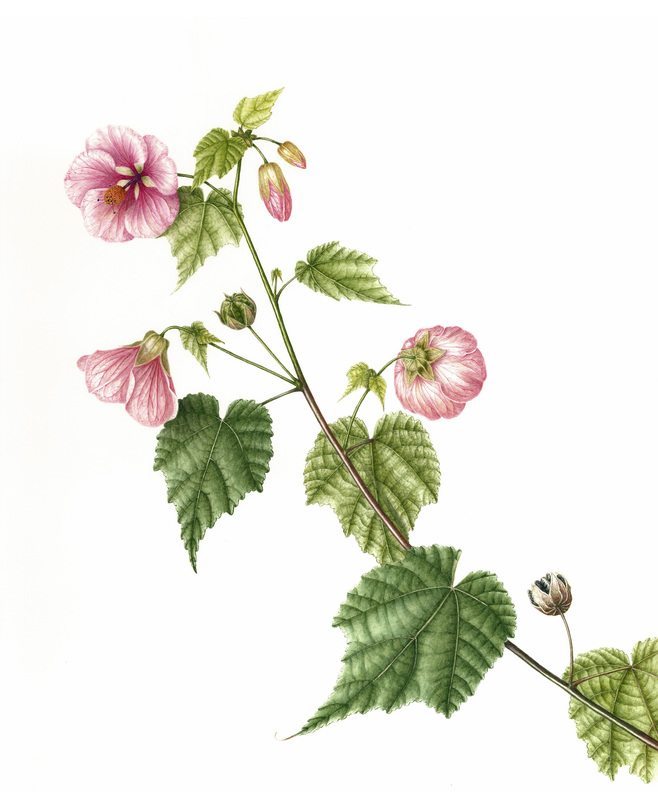 The Mark Catesby and select pieces of the Filoli and Highgrove Florilegiums prints were exhibited in the ballroom, and well worth a visit. When the crowd gathered at the reception for the presentation of awards, we were thrilled to hear that Melanie Campbell-Carter was presented the Roth Award, “for distinction with an emphasis on traditional botanical art presentation” for her Duabanga grandiflora. Lee McCaffree was presented with the Bourn award, “for distinction with an emphasis on horticulture” for Narcissus ‘Delibes’, the Alcatraz Daffodil. The third award, the Jurors’ award, “for distinction with an emphasis on botanical art presentation”, went to Milly Acharya for her Lathyrus odoratus, Sweet Pea. Everything about the day was perfectly delightful, and we feel that we have blazed a trail for future BAGSC jet-setting adventures! We heartily encourage everyone to see the exhibit before it closes on June 12, and to enjoy the beautiful spring gardens at Filoli. 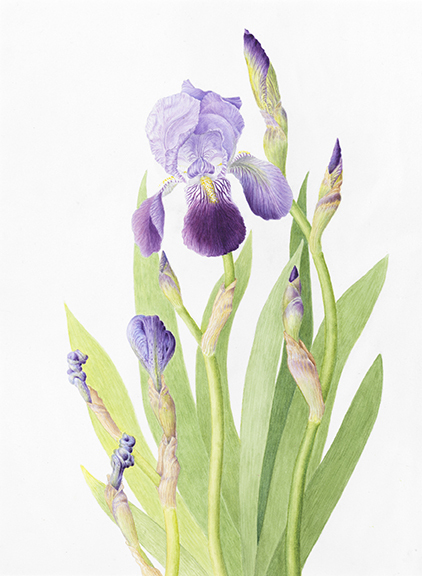 The 18th Annual Botanical Art Exhibition at Filoli goes through June 12th. 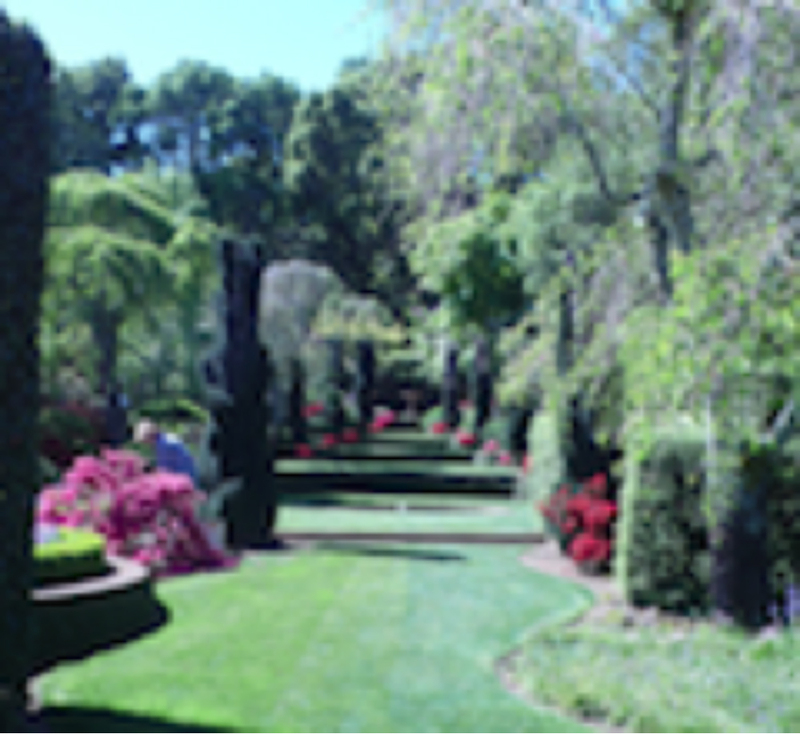 Filoli is located at 86 Cañada Road, Woodside, CA 94062. Kudos to all the award winners, and congratulations to all the accepted artists! Quercus agrifolia, Coast Live Oak. colored pencil by Jan Clouse, © 2105, all rights reserved. I am perpetually drawn to two particular subjects: eucalyptus and oaks. Two varieties of oaks are native to Santa Barbara. The Coast Live Oak grows everywhere in town, in fact, mighty examples anchor each end of my block. And over the Santa Ynez range of mountains the Valley Oak dominates the landscape. This particular branch came from a tree about 3 blocks from my house with summer acorns, green and fresh. For me, part of its charm was the sprinkling of empty brown caps from the year before. 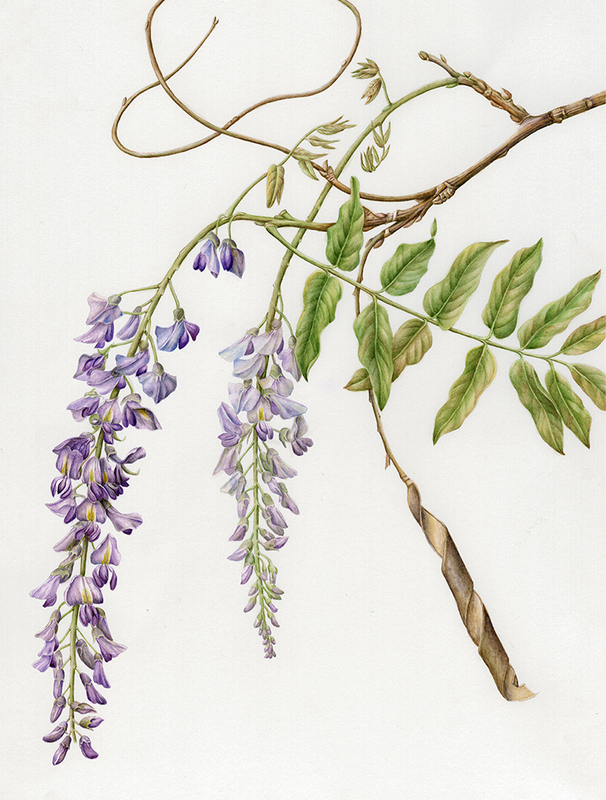 The Botanical Art Exhibition at Filoli is open Tuesday, March 24 through Sunday, June 7, 2015. Visit their website for hours. “Dutchman’s Pipevine with Pipevine Swallowtail Butterflies” (Aristolochia californica with Battus philenor), watercolor by Joan Keesey, © 2015, all rights reserved. A watercolor painting of “Dutchman’s Pipevine with Pipevine Swallowtail Butterflies” (Aristolochia californica with Battus philenor) by BAGSC member Joan Keesey has been accepted into the 18th Annual International Show of the American Society of Botanical Artists (ASBA) at the HORT Gallery of The Horticultural Society of New York in mid-town Manhattan, September through November 2015. This seems fitting to me, because Joan first saw these butterflies and their caterpillars on pipevine during our first hike along Big Chico Creek in Upper Bidwell Park, Chico, a few years ago. In January 2015 we moved to Chico, and have discovered Pipevine and its inhabitants on our very own property. Recently two caterpillars (black with orange spikes) have each formed a chrysalis (what is the plural?) in a jar in our kitchen, and then soon emerged as beautiful Pipevine butterflies (black + iridescent blue with orange spots)! Truly miraculous! The stress of moving was mitigated somewhat by learning that Joan’s “Hummingbird Sage” (Salvia spathacea) watercolor painting had been awarded First Place at the Botanical Art Exhibition of the California Native Plant Society’s 2015 Conservation Conference in San Jose, California, in January 2015. Then in March 2015, Joan’s watercolor painting of Matilija Poppy (Romneya coulteri) won the Roth Award “for distinction with an emphasis on traditional botanical art presentation” at the 17th Annual Botanical Art Exhibition at Filoli in Woodside, California. Whooeee!!! Is it any wonder that I am proud of her? Thanks for letting me toot her horn! Pinus ponderosa, Ponderosa Pine by Carrie DiConstanzo. Winner of the 2013 Roth Award for distinction with an emphasis on traditional botanical art presentation. © 2014, all rights reserved. BAGSC members Nina Antze, Joan Keesey, Patricia Mark, Mitsuko Schultz, Gilly Shaeffer, and Deborah Shaw have been accepted into the 16th Annual Botanical Art Exhibition at Folili in Woodside, California. There were 167 entries submitted this year from 68 artists and the jurors selected 65 for this exhibition. The Exhibit will be on display from Tuesday, April 8 through Sunday, June 8, 2014. In addition to the 65 contemporary works displayed in the Visitor and Education Center, select pieces from Filoli’s three major florilegia collections, the Filoli, the Banks’ and the Highgrove will be on display in the historic House during the same period. The Artists’ Reception is scheduled for Thursday, April 10 from 5:00 p.m. – 7:00 p.m. Artists will be on hand to share their expertise and experiences. Prints, matted originals and note cards will be for sale. An after-hours Garden visit will be available that evening as well. The reception is free, but reservations are required by Friday, April 4. Register online or by calling Member Services at 650-364-8300 x 508. Additionally, a lecture titled Plant Portraits: The California Legacy of A.R. Valentein will be presented Thursday, April 10, 2014, 3:00 pm–4:30 pm by Margaret Dykens, Director of Research at the San Diego Natural History Museum. 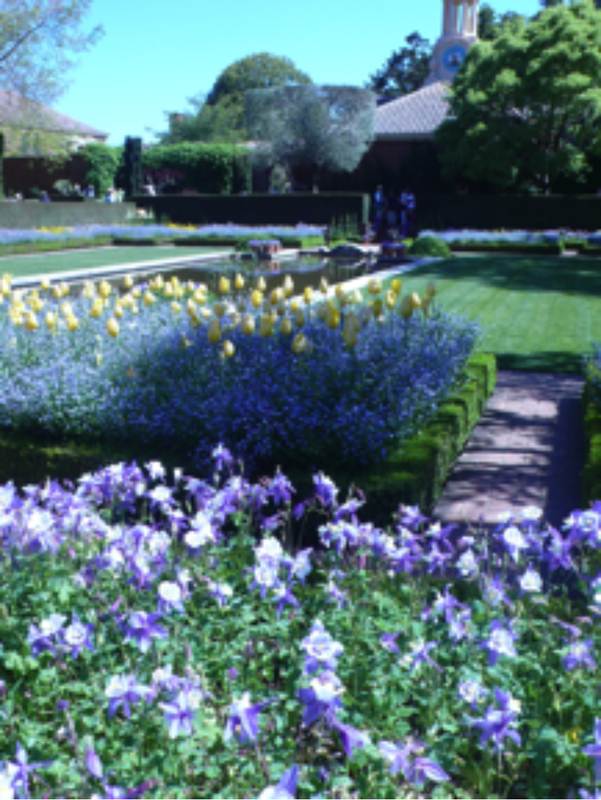 A nominal fee of $25.00 for Filoli members; $30.00 for non-members will be charged. A book sale of the 212-page catalog by the same name and book signing will follow the presentation. Register online for the lecture, or for both the lecture and the reception, or by calling Member Services at 650-364-8300 x 508. Congratulations to all! From the list of participating artists and works, it promises to be a wonderful exhibition. 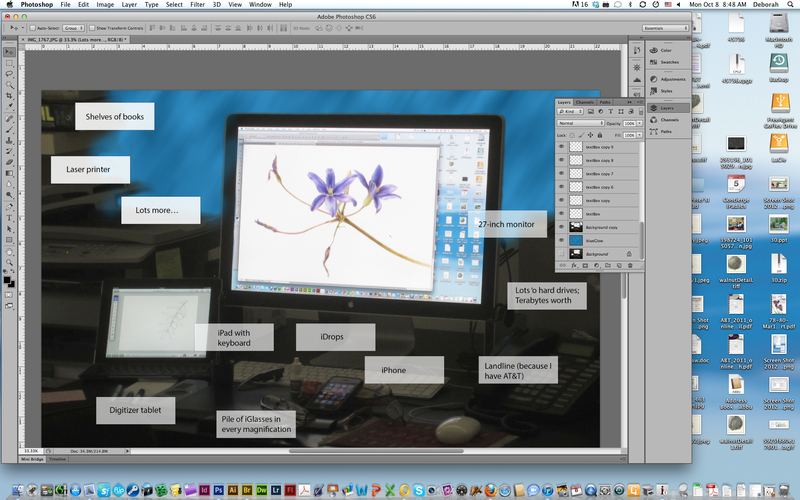 Beginning Photoshop for Botanical Artists (or other artists) at Filoli. Composite image © Deborah Shaw, 2012. 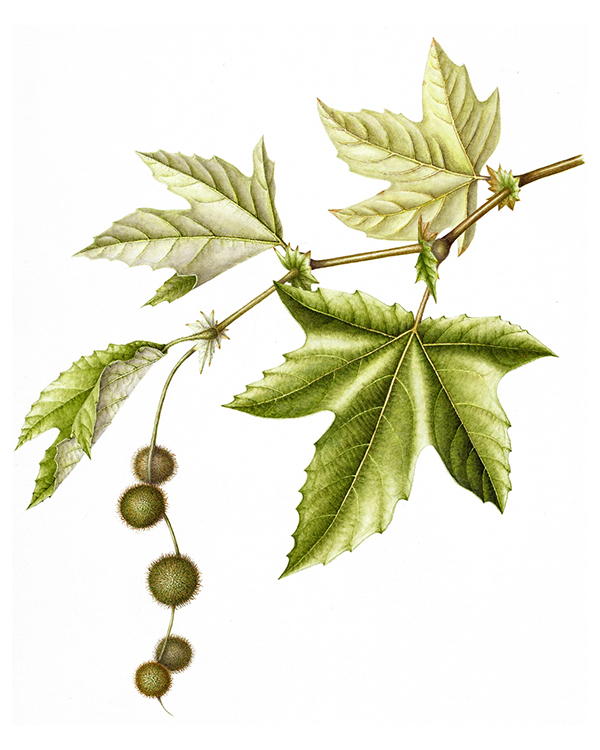 BAGSC member Deb Shaw will teach a beginning Photoshop class for botanical artists at Filoli, Friday August 2 and Saturday, August 3, 2013, from 9:30 am to 3:30 pm each day. Explore using Photoshop or Photoshop Elements to improve your botanical art in this hands-on class. A combination of quick lecture segments and hands-on tutorials will cover: how the software thinks about botanical art; how to keep the digital world from destroying your beautiful gradations; resolution, scanning, resizing, and layers; and using the computer as a tool for composition and feedback. Learn how to scan and reproduce your artwork for submission to exhibitions, printing, and uploading to the web. Detailed handouts and “cheat sheets” will be provided. Images will be supplied for class exercises; feel free to bring your digital images for additional exploration. Class participants can subscribe to a free, 30-day trial of Photoshop, Photoshop Elements, or the entire Adobe Suite of programs. If you have an iPad (or similar tablet), you may also want to take a look at Photoshop Touch. It’s a great app, and we’ll cover it in class. Register on the Filoli website, or download a registration form from the same web page. Prerequisite/requirements: Participants must bring a laptop (either Mac or Windows) with Photoshop CS5 or higher (preferred) or Photoshop Elements 9 or higher installed and running. A 30–day free trial is available (see above). Please contact the instructor, Deborah Shaw, for more information and to get assistance with the download. Class time will not be spent on loading software. Participants must have basic knowledge of their computer, including how to save and find files on their hard drive. Enrollees in the Filoli Certificate Program will earn 8 hours of credit for this class. The Sunken Garden at Filoli. Photo by John Keesey. On Thursday, April 18th, John and I attended the Artist’s Reception at Filoli. We spent the morning checking out the exhibit and looking at the garden, always beautiful, but sensational in the spring. The garden is a series of “garden rooms” similar to the Hidcote Gardens in England; each room is surrounded by a hedge of shrubs or trees and usually contains a fountain or pool. Each “garden room” has a color scheme. I spoke with one of the volunteer gardeners who said that the colors change with the seasons and from year to year, but each year there is a master plan. The first garden you see is the sunken garden. This year it is cobalt blue and white columbine, cerulean blue forget-me-nots, and hansa yellow tulips. The wisterias that climb up the brick walls of the Georgian style house were all in bloom and spectacular. There were also many bushes with a very small, quinacridone red azalea that was quite stunning. It was a perfect day. Quinacridone Red Azaleas at Filoli. Photo by John Keesey. There were 64 works of botanical art by 50 artists including the two jurors, Carol Hamilton and Susan Fisher. 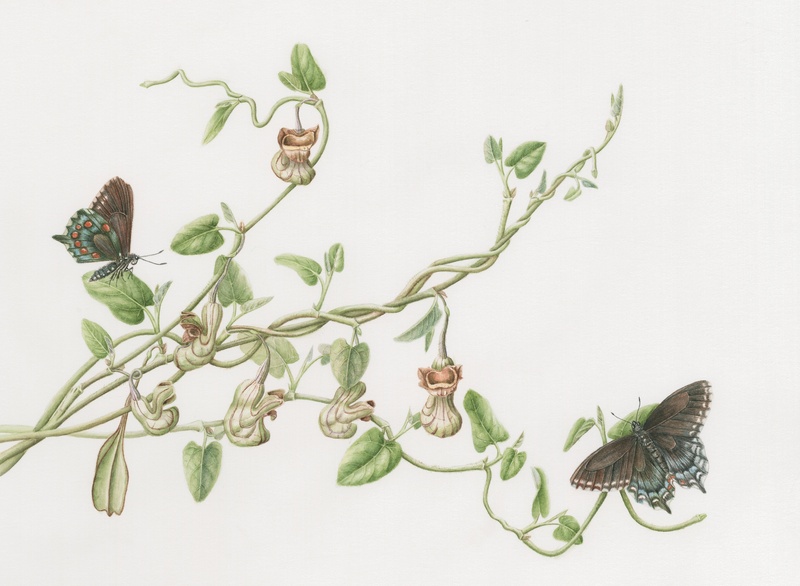 The Botanical Artists Guild of Southern California (BAGSC) was very well represented with seven artworks by five artists—Alison Denning, Joan Keesey, Sue Kuuskmae, Mitsuko Schulz, and Deborah Shaw. We went back for the Artists’ Reception at 5:00 pm. It is always very pleasant with wine, very nice appetizers, and the opportunity to meet other botanical artists. 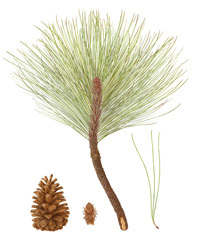 Carrie DiCostanzo won the 2013 Roth Award for distinction with an emphasis on traditional botanical art presentation with a beautiful picture of “Ponderosa Pine” (Pinus ponderosa). 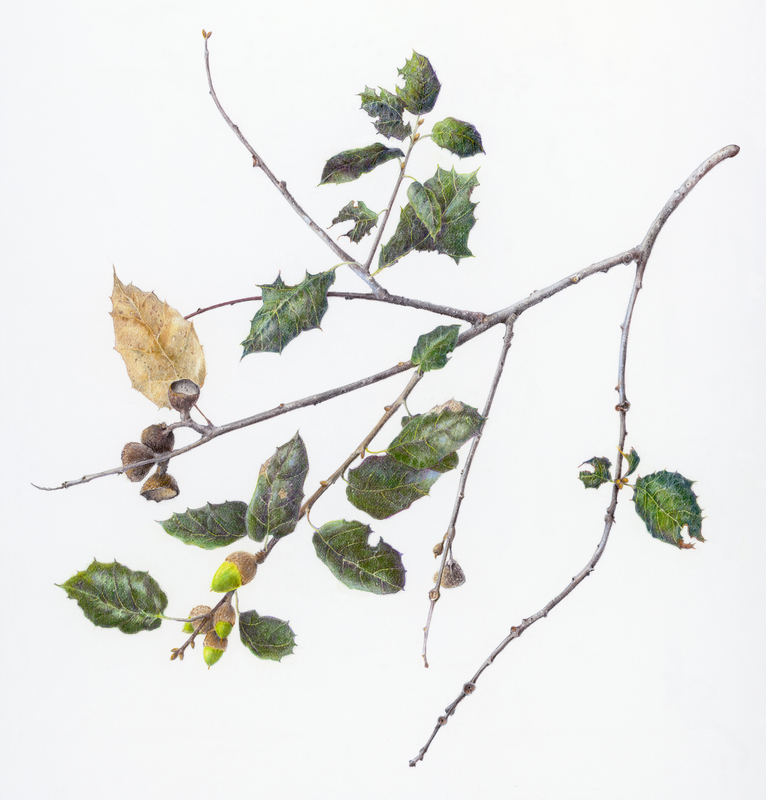 Maria Cecilia Freeman won the Juror’s Award with an exquisite picture of “Tan Oak” (Notholithocarpus densiflorus), and Ingrid Finnan won the Horticulture Aware with a delicate picture of “Dandelion” (Taraxacum offivinale). 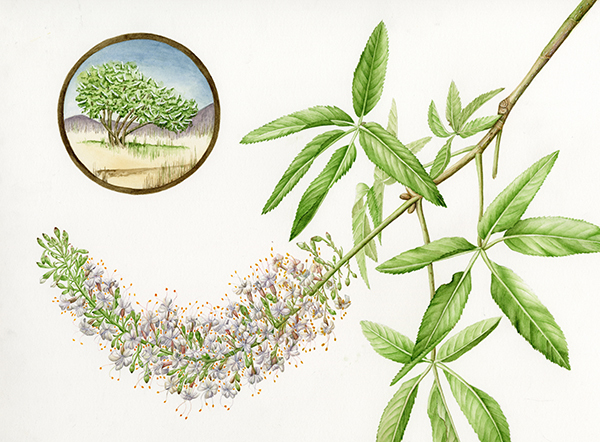 “Aesculus californica,” California Buckeye, watercolor by Joan Keesey, © 2013, all rights reserved. 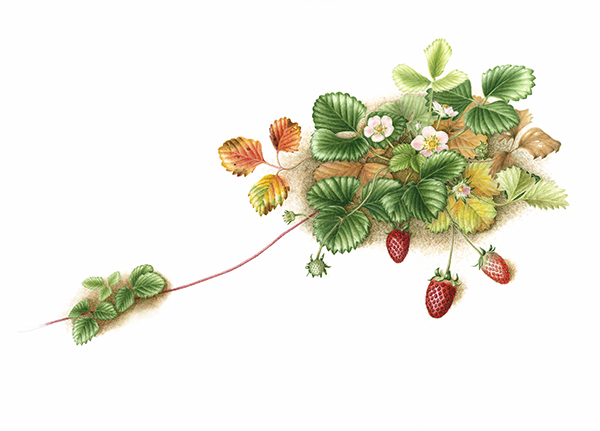 “Fragaria x ananassa ‘Fragoo Pink’,” Strawberry, watercolor by Mitsuko Schultz, © 2013, all rights reserved. “Iris,” Iris, watercolor by Alison L. Denning, © 2013, all rights reserved. 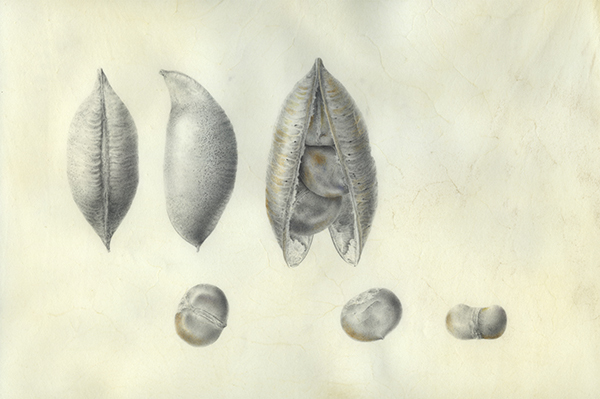 “Castanospermum australe,” Blackbean, or Moreton Bay Chestnut, seed pod and seeds, Graphite and Watercolor on Vellum by Deborah B. Shaw, © 2013, all rights reserved. 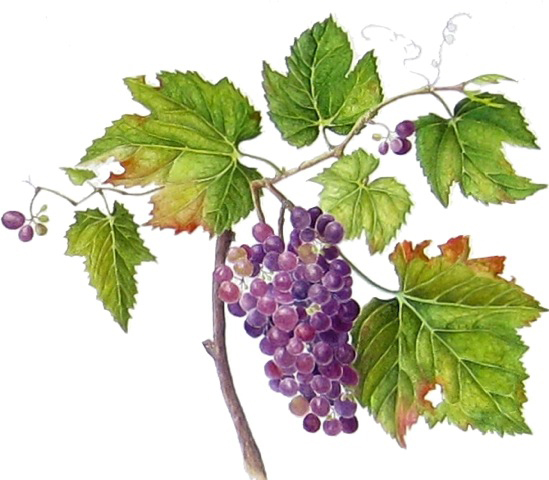 “Vitis vinifora,” Grapes, watercolor by Suzanne C. Kuuskmae, © 2013, all rights reserved.